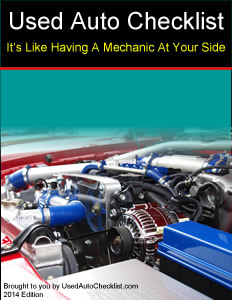 If you're researching in the library, you should become more familiar with the automobiles that interest you by taking a few minutes to look through a few books on auto repair. If you're unfamiliar with any of the items in Part II or on the checklist, these books will help you. Understanding the items on the checklist will make the process of inspecting an automobile much easier. If you're researching online, click here for a list of resources and click here to find manuals for the used car, truck, van or SUV for which you are looking. Having this information on hand will help you in Part II and the checklist.